– This post was last updated on October 23rd, 2018. 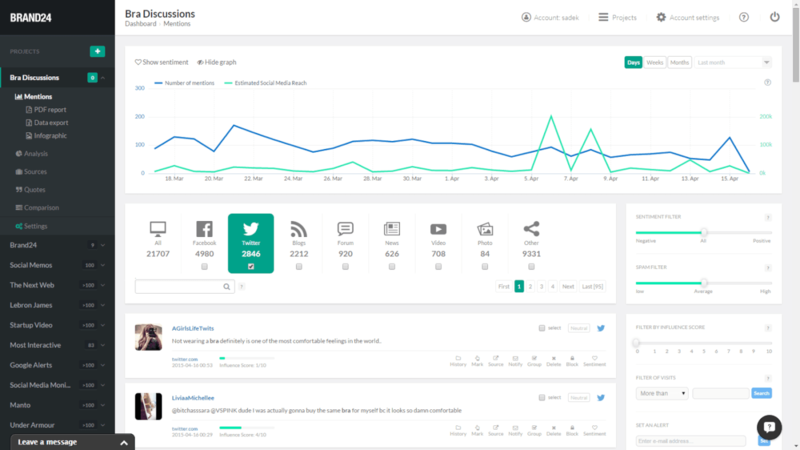 So you’ve started to collect social listening data: mentions about your company, brand, and competitors, or discussions that are relevant to your business. But what’s next? You’re probably asking yourself – what can I do with all these fancy statistics and data? Well, there are many ways you can leverage this information. Here are some applications for social listening to help you better understand how you can use the data you collect to improve customer satisfaction and grow your sales. Customer service is a very popular application of social listening and a very effective one at that, as more and more people start to use social media as the place to make public complaints, find solutions to their problems, and commend brands on good service. Customers find it easier to post a status on Facebook or Twitter rather than try to reach an automated call center and wait for ages to get a response regarding an inquiry sent via e-mail. This trend gives brands plenty of legroom for responding and reacting to customers who encounter problems. Social media monitoring can improve the quality of your customer service through digital channels. People hate to wait and be ignored. They’ve gotten used to getting everything as fast as possible. They want to be serviced right here and right now. That’s why timing matters when it comes to customer service. With social listening, you can collect these questions and complaints as soon as they’ve been published and react immediately. 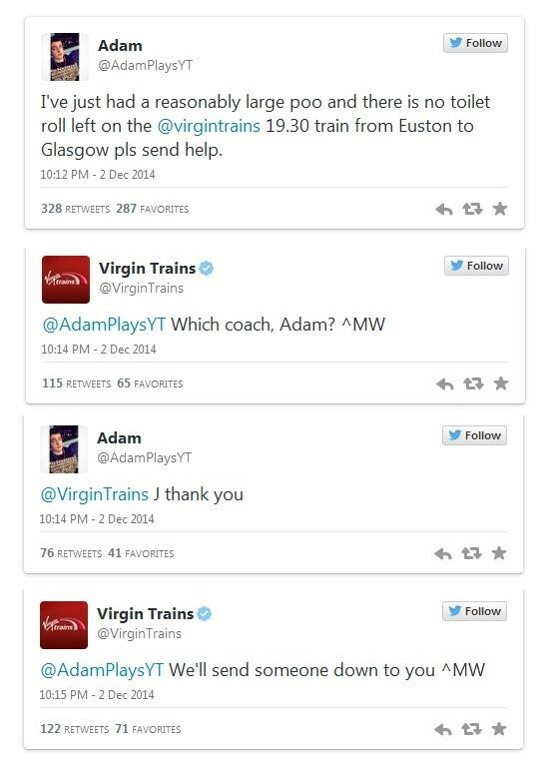 One of the most spectacular customer service stunts came from Virgin Trains, a company that knows how to do social media. They had a passenger traveling from Euston to Glasgow who got caught in an emergency situation in the bathroom. He was out of toilet paper when he needed it most. What would you do in a situation like this? The passenger played his cards and tweeted about it, informing the company about the problem. The social media manager that tweeted back to the passenger reacted professionally and took care of the issue immediately, providing their passenger with toilet paper. We covered sales lead generation in a separate article where you can get comprehensive knowledge and find inspiration on how to locate prospects with social listening. With well-configured keywords for Internet monitoring, you can find potential clients through social media. The majority of customers will ask for online opinions and search for advice on the web before making a purchase decision. Brand24 collected almost 45 thousand mentions that included the question “where can I buy” within one month. There is enormous space for brands to join in on the conversation and offer their prospects the products which they’re been looking for. Intrusive marketing that pushes goods to people who do not necessarily need them is replaced with permission marketing, which caters to clients who might find a particular offer relevant to them. Consumers no longer want to be pelted with ads that do not match their preferences. 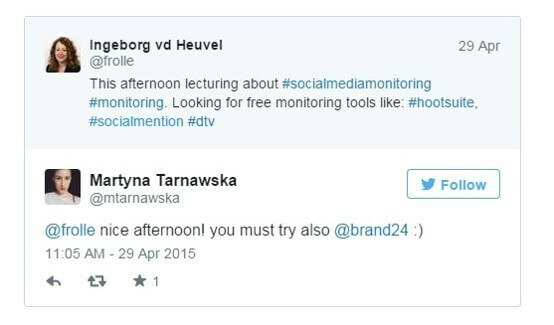 We use Brand24 ourselves to find people who’ve been asking about recommendations for social media monitoring solutions online. Our community manager then does a great job of interacting with these users and letting them know about Brand24. This is one of our best methods of identifying new leads and has one of the highest conversion rates, too. Why? Because we reach out to those who have a real need for our product. There are naturally many more examples of brands reaching out to prospects via social media. For instance, Brayola, an online store that helps clients find their perfect bras, reaches out to prospects using Brand24. How do they do that? The brand tracks and picks up online conversations about uncomfortable bras. Then Brayola consultants join the discussion, offering their assistance in customizing the ideal bras while promoting the brand and their products to the audience. Here is another example of a smart reply by Airbnb, a brand that connects people who want to rent-out their lodgings with people who are looking for accommodation in those areas. Dan Wetzel, a Yahoo Sports journalist, mocked the hotel arrangements in Sochi right before the Winter Olympics 2014, as many of them lacked even basic facilities. He made a joke, offering 3 light bulbs in exchange for a door handle. 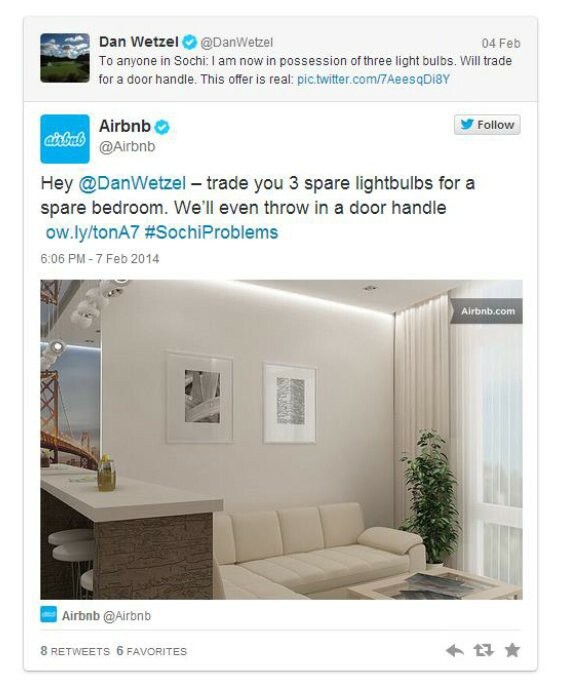 The social media rep for Airbnb took this seriously and offered him accommodation in return. Nowadays, one of the best solutions for online marketing campaigns that increases both social media reach and user engagement, is to encourage people to share content with a dedicated hashtag. Somersby, a leading brand of cider from Danish brewing company Carlsberg Group, is an excellent example when it comes to this. They’ve designed numerous campaigns that have successfully engaged their fans, and amplified the effects of this by building strong relationships with bloggers and influencers. For instance, when they introduced a new variety of Somersby to the Polish market, the brand involved dozens of bloggers and encouraged people to share content (especially photos) with a dedicated hashtag. Improved overall sentiment towards the Somersby brand and huge social media reach are just a couple of examples of the impressive results that Somersby obtained from this campaign. Beyond that, the new beverage became the bestselling beer in its category and the brand executed what became an annual sales plan in just 4 months. These days, more and more brands are engaging in online discussions with their fans and clients. Once a user posts something on social media that is related to either a brand or an entire industry, social media managers are there to start interacting with the audience. This is a great way to increase customer engagement on the Internet, extend your online reach and win your fans’ hearts. If your response is timely, intelligent, and humorous yet consistent with your brand image (you should not be making jokes if your company’s profile is very formal), you can easily catch your users’ attention. Take a page out of PlayStation’s book and learn how you can join online discussions to obtain all of the desired results. PlayStation uses social listening to find conversations that are somehow related to gaming, gamers, and the brand itself. Then they invent creative and funny responses that engage their users and encourage gamers to play on the PS console. Find out more about PlayStation’s Internet monitoring strategy from our previous entry. Consumers are increasingly more willing to share their opinions and reviews about the products or services they use. Naturally, they do this through their social media profiles, exposing their reviews to a great deal of other consumers. Frequently, this is also how they give suggestions and feedback on these goods and services. Thus, Internet is a powerful source of valuable customer insights. Brands can leverage these insights in their product development process. They can find inspiration and ideas for new models or improvements to their product in social media mentions. Just like GoPro did when they introduced their new camera – GoPro Hero4. We analyzed the social media discussions regarding both releases – Hero3+ and Hero4. The insights gathered during the Hero3+ premiere included lots of suggestions for features that could improve customer experience, which then appeared later on in the succeeding model – GoPro Hero4. On top of that, customer insights from social media are more reliable than those from other sources. Thus, it’s worth listening to your audience. Your fans and clients can give you valuable advice on how to improve your goods and services. They are the ones that use them, so they know best about what will make these products even more appealing. Collaboration with social media influencers who have wide audiences can bring you measurable results. Naturally, they first need to be potentially interested in your company or its value proposition. 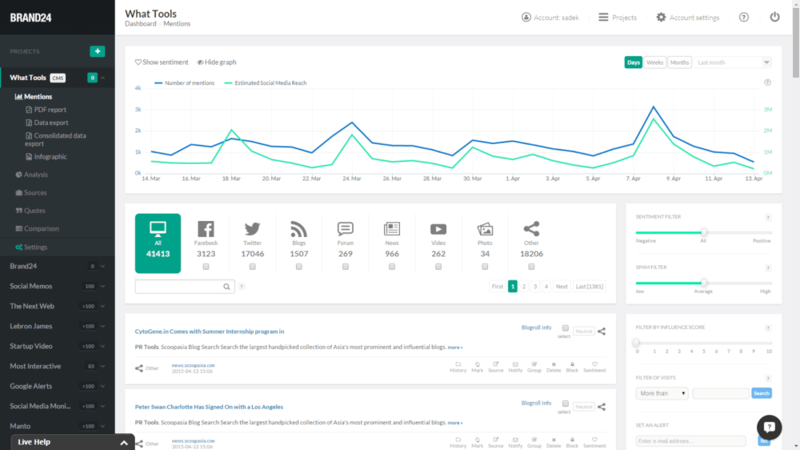 Social listening makes it possible for you to discover influencers who are talking about your brand / company or a specific topic linked to your business. If you access the Analysis tab in Brand24’s dashboard, you’ll find information about top authors who’ve posted any content about your brand (or specified topic) in a specific period. This can include users who have enormous audiences. However, the fact that someone has created one post about your brand does not necessarily mean that he or she will resonate with what your brand is promoting. There is also another list that not only includes the social media reach of these authors, but also the number of mentions that they’ve created. The combination of these two variables composes an indicator – share of voice – which informs the part of the whole discussion that was generated by a specific author. Users included in the list of influencers with the highest share of voice are likely to become your brand ambassadors or be interested in collaborating with your brand.You can also use influence score filter in the tab Mentions (or Sources) to see only the authors with the biggest influence. You can also use the influence score filter in the Mentions tab (or in Sources) to view only authors with the greatest influence. A very good example of a company that uses social media monitoring to find influencers is Zortrax, a Polish producer of efficient and professional solutions – an integrated 3D printing environment that includes 3D printers, Z-Suite software, and printing materials. Zortrax cares about the relationship they have with their clients as well as the most active social media influencers who publish content about their brand. The company finds influencers through social media monitoring and converts them into loyal brand ambassadors. They have already engaged a group of eager “activists” who evangelize and educate the online community, e.g., on how to use a 3D printer. This is extremely important, as loyal customers can provide you with the type of great promotion that no paid advertisement can give you. Read more about Zortrax social media strategy. This is the most common and most obvious application of Internet monitoring, and an extremely important one as well. Very often, a fast response to a negative review or fake and pejorative comment can prevent a serious brand image crisis. Brandjacking, which is when someone steals the online identity of a brand just so they can undermine them, can do serious damage if not spotted early enough. Some users might create fake profiles posing as official brands just to hurt the very customer relationships that you’ve worked so hard to build by creating false content under your name. If you discover a profile like this early enough, you can immediately rectify it and nip social outrage in the bud. This also concerns unsatisfied customers who complain about your service or product. If you can find their comments once they’ve been published, then you’re able to reply on the spot to him or her and try to solve the problem, compensating for any inconvenience and promising to prevent similar situations in the future. Internet monitoring enables you to track all user reviews and comments in real time, so you will never miss a hot spot for any potential crisis. This is one of the most valuable customer insights you can derive from Internet monitoring. Recommendations that are left on social media and other online platforms very often include a detailed description on the product / service, which can influence consumer decisions. We’ve conducted numerous analyses based on online discussions which have helped us understand consumer behavior and user attitudes towards specific products, services, and their features. These analyses let us uncover the most common reasons for (not) buying a specific product. Understanding the key factors behind the reasons why your clients decided to choose your offer can give you a significant advantage over your competition. For instance, we analyzed online discussions about smartwatches on the Polish market and examined the criteria for customer evaluation. It turned out that the most important factor behind choosing any particular model was based on appearance, and the second one – battery durability. 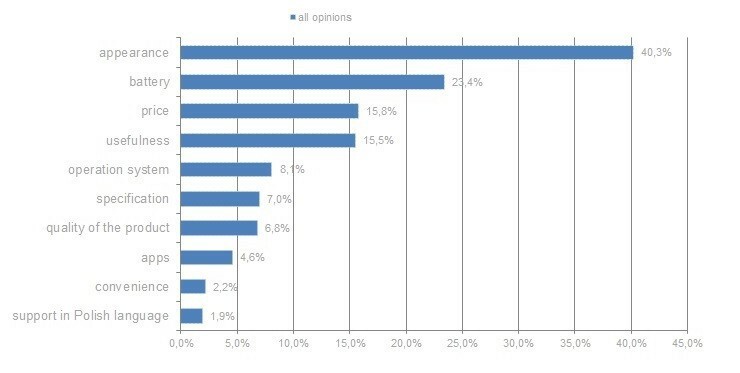 This chart indicates that customer support in the Polish language has little influence on general opinion for smart watches. Thus, even though it is negatively evaluated (the chart below show 100% negative opinions), companies do not need to focus on this refining this feature. It will not have a significant impact on purchase decisions. Internet monitoring is widely used by bloggers when they try to find inspiration for future content. All authors have probably struggled at some point with finding ideas on what to write about. Social listening can help with this as well. 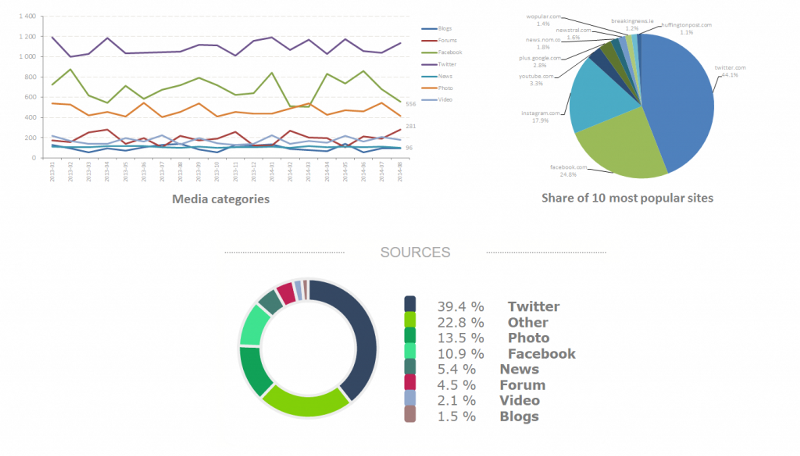 Monitoring tools can give you insights about what is trending on the Internet and what people want to read about. It is as easy as pie. 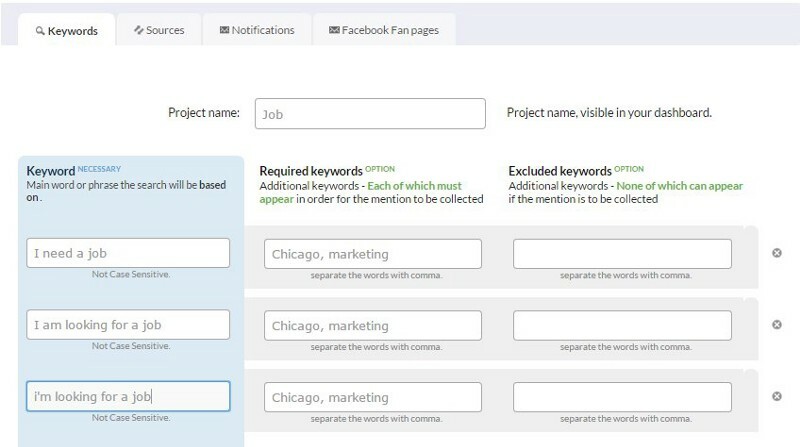 You just need to set up project for monitoring topics related to your site’s content. Naturally, keyword selection depends on your company’s industry or blog category. For example, let’s take a blog that helps companies find solutions to develop their business. In this case, we should think about the catchiest key phrases that relate to this topic. Which tags and hashtags do they use? What are the most common words in this field? When configuring your project, you should select the option for monitoring topics and then enter a key phrase that perfectly reflects the topic your company is focused on. In this case, we went for “growth hacking” “grow your business”, and “business growth” (separated with commas), which often appear as buzzwords in relation to tips, strategies and tricks for business development. Don’t forget to include variants without spacing between words in a key phrase. Often, these buzzwords are used as hashtags. This is an endless source for topic ideas that can help you with content creation. One of our clients – Veeu Network, a digital video company, uses social listening precisely in this area. Before writing any scripts for new videos, they first dig into social media discussions to see which topics are the most relevant at the moment according to their fans. Learn more about Veeu Network video strategies. Our article about using social listening as recruiting tool covers this topic well, as this is yet another department that can take advantage of social media monitoring. People post on social media about everything, including when they are looking for a job. For recruiters, this is a perfect opportunity to reach out to potential employees while saving lots of time. You can easily set up a project to monitor phrases like “looking for a job”, “I need a job”, etc. You can then curb these results to specific geographic regions and industries by adding required keywords. Once Brand24 collects the first mentions, you’re ready to start reaching out to potential employees. You can reply to them in a tweet or post or send private messages asking for more details about their personal background. It is totally up to you and depends on the job. Do you plan to introduce a new product or conduct a social media campaign? The very first step you need to take is to learn about your target audience and the people you want to address in your message/product. Thus, you need to study the market you want to enter. There are many ways to approach this research and social listening is one of the most reliable methods. You can derive a lot of information about your target group based on the data that you monitor, including demographics, channels, and periods for when your audience is most active, not to mention the levels of their engagement, context of discussion, and much more. This data can help you design the most effective marketing strategy. You can learn where you should address your campaign, what time you should set up social posts, as well as which language you should use in order to convey your message to your prospects and clients most effectively. See what you can learn from monitoring data. This is especially useful information for agencies and CMOs that need to report the effects of their strategies in the form of numbers to a board of directors. Marketers are all familiar with the values of outdoor, TV, or press advertisement. Online channels, on the other hand, are not always trusted, especially when it comes to ROI. However, data from digital media is even more accurate and measurable. You cannot precisely estimate how many people have made a purchase decision after watching a TV commercial. If you display the same ad in an online channel, you can collect precise information about conversion rates at each step of the customer acquisition process. Brand24, an effective Internet monitoring and analysis tool, can help you estimate the value of online discussions about your brand. When you combine variables like: size of a profile, number of interactions with content, and the social media reach of this content, you can learn how many people have potentially encountered mentions regarding a specific topic and calculate the estimated value of conversations like these. The estimated reach is equivalent to the amount of exposure from display ads. Thus, not only can you find out how many people have encountered online content about your brand, a particular campaign, or product, but can also estimate the social media advertising value, which is the real market value of an asset in terms of the average market cost of advertising after discounts. Try Brand24 for free now and take your business to the next level with Internet monitoring!